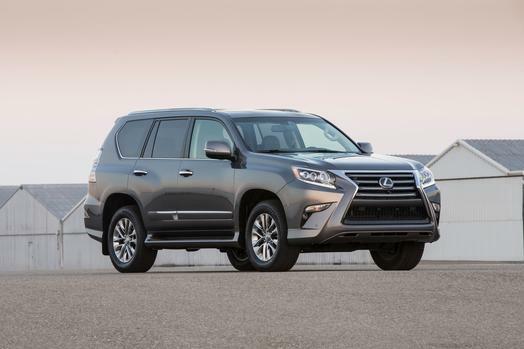 For 2014, the Lexus GX improves an already aggressively styled exterior. The front fascia sports a bold new grille and standard LED headlights and daytime running lamps create an imposing on-road presence. The 2014 Lexus GX is powered by a sole 4.6-liter V8 that pumps out an impressive 301 horsepower and 329 lb-ft of torque. That high output propels the 2014 GX from 0-60 mph in a brisk 7.8 seconds – a highly competitive time for the class. Despite the 2014 Lexus GX’s impressive 0-60 mph sprint time and plus-300 horsepower performance figures, it still manages to return a respectable 15 mpg city and 20 mpg highway. The 2014 GX is undeniably a Lexus, so there is no lack of premium materials, but the laundry list of available technology is unprecedented even for the luxury class, and includes a navigation system with voice recognition and LCD display, the Lexus Enform system, Bluetooth connectivity, dual-screen DVD rear-seat entertainment system, and a Mark Levinson 17-speaker sound system. Standard safety features on the 2014 Lexus GX includes Electronic Brakeforce Distribution, Smart Stop Technology, stability and traction control, a comprehensive suite of airbags, and hill-start assist. The available wide-view front and side monitor system with a rearview camera provides unprecedented exterior visibility inside the 2014 Lexus GX.